Earth's Internet & Natural Networking: Proof of Complex Plant/Bacterial Networking Interactions, Yet Why Does Conventional Science Reject it ? Proof of Complex Plant/Bacterial Networking Interactions, Yet Why Does Conventional Science Reject it ? 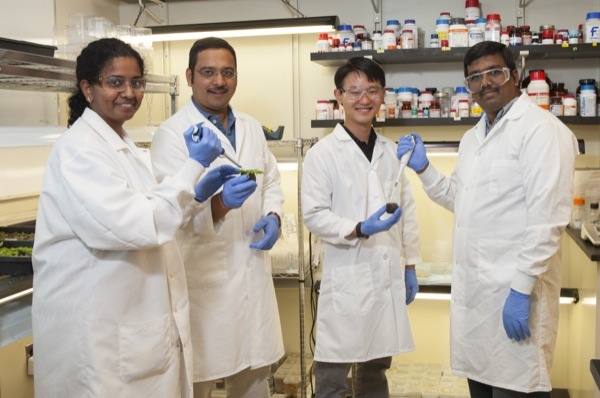 UD plant scientist Harsh Bais (second from left) is shown with research collaborators, from left, postdoctoral researcher Amutha Sampath Kumar, Jeffrey Caplan, associate director of the Bio-Imaging Center, and postdoctoral researcher Venkatachalam Lakshmanan. This group of student researchers came up with more incredible proof of just how complex and sophisticated our natural world truly is. They've offered further proof along with countless other reports and studies over this past decade by others that the natural world has a superior way of functioning than the conventional Old school thinking which oddly enough still has the reins of power and rules with an iron fist. On special note here I glad to see that these people are from some of the Asian countries and that's exciting as their countries can certainly benefit from their experience in utilizing natural world resources to holistically manage forested wildlands and agriculture responsibly through true biomimicry. These countries have been under strong pressure by the US & EU governments to accept the bad science technologies of Monsanto, Syrgenta and Bayer to name a few. But I'll get to that in a moment later on below. This above article came out on August 27, 2012 and you may follow it below. Let's take a look at a few of the photos of the bacteria and notice the fluorscent staining used to highlights the bacteria for viewing. 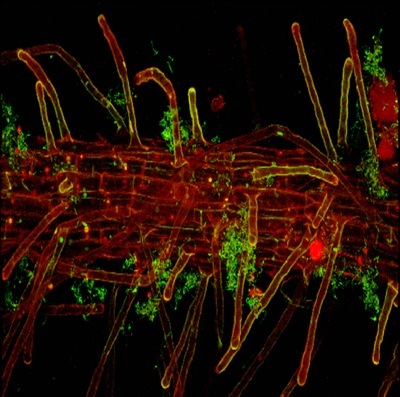 The type or variety of soil bacterium is Bacillus subtilis which colonized the roots of the laboratory plant Arabidopsis thaliana which you can see here below. The plant is a rather plain looking in the sense of it's landscape ornamental value, however this small flowering plant widely used by plant biologists as a model organism for basic research. 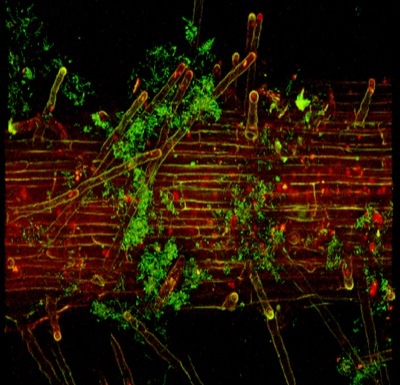 Let's look at another shot of the root colonization with Bacterium. I find the pictures so fantastic for illustrating the rather complex symbiosis which keeps almost every type of plant ecosystem worldwide in perfect health. As a general rule you will not find much disease and insect attacks as you do with most urban landscapes and home gardening projects or for that matter industrial agriculture. This is because most profit driven Corporations who claim to use science-based technological advances reject most of these findings in favour of quick fix chemical fertilizers and pesticides which must be consumed on a regular basis to be effective. A magnified stomata (pore and surrounding guard cell) on a plant leaf is shown being attacked by pathogens. However, when the beneficial bacterium Bacillus subtilis is added to the plant's soil, the bacteria signal the stomata to close, cutting off the pathogens' access to the plant interior. Take look at the above photo of these side by side slide pictures of the pores of the plant, Arabidopsis thaliana and the contrast between one plant inoculated with the beneficial soil bacteria and a plant without. These two pictures are of the plant's breathing pores. One is being attacked by the pathogens and the other not. Question is why ? Yet today the type of SCIENCE that rules with an Iron Fist in the form of technology that controls what we do and use either in our Gardens, Landscaping, Agriculture or even Wild Habitat Restoration doesn't necessarily respect such Scientific Research and it's possible Biomimicry replication of how Nature is intelligently constructed. They know how it functions and cooperates(how can these fools not know with the massive volume of papers available) , yet they opt for these failed old school technologies brought to us out of World War II where Science through it's chemical research in inventing bigger and better bombs, realized that rather than shutting down research and losing business after the War, that such debased technologies could be packaged, marketed and labeled with the title -> "Green Revolution" which was going to save mankind. Nothing could be further from the truth. There are mountains of evidence today that prove otherwise. Yet with such above research as mentioned at the top of this post, the powerful commercial elements in charge of what happens in our world resist such recognition of a holistic approach. Why ? Because the chemical technologies and their endless product line produce billion$ to these corporate giants and their impatient investors. But something in the natural world is changing. Many places on Earth now have a break down in these very incredible Symbiotic relationship functions mentioned above. In all my 56 years of experience, problems with terrible insect infestations and plant disease pathogens have always been a normal part of the urban garden and landscape. 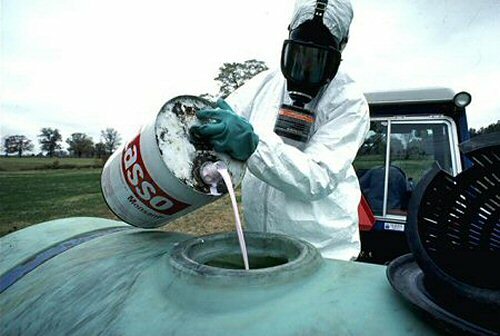 They were also a constant source of pain to Farmers who for decades have practiced this defective conventional line of chemical dumping agricultural practices. Where ever I have personally visited a wild forested ecosystem no matter what the climate or plant community (Desert, Savanna, Temperate, Tropical, Boreal , etc) , you never once saw the large scale damage so common to human project endeavours. Plants were almost always healthy and vigorous and attacks while present were minuscule or almost undetectable. Not that pathogens and so-called bad insects weren't present in a wild setting. They are indeed there but not in devastating numbers like we see in chemically managed landscapes. The wild system has always had perfect checks and balances when left to it's own. This is becoming no longer the case. "European Climate Change to hit Scandinavia and South Hardest"
3 May 2012 (AFP) – Global warming in Europe this century will mostly affect Scandinavia and the Mediterranean basin, the European Environment Agency warned on Thursday. "The highest warming is projected over the eastern Scandinavia, and southern and south-eastern Europe," experts at the agency said in comment accompanying a series of maps posted on the agency's website." Well true enough things are a little bizarre over here to say the least, but southern Europe has been experiencing some of the worst fire season involving Spain, Canary Islands, France, Italy, Croatia, Greece and Turkey. Another interesting phenomena reported by Media was that trees would have smaller leaves as a result of this change of climate. True enough we have seen this here. At this point I've simply got a gallery of pictures of different shrubs and trees in the wild forest here which defies description, especially when you are personally there and viewing it for yourself. Here are a few examples from the forests all around my home. This is the clustered red fruit, but this year fruiting is rare and looks as terrible as this example. This is the only tree in the woods near my house that had fruit and there are literally 1000s of trees from small to very large old growth. Now this next picture is what the tree foliage and it's very abundant fruit clusters normally look like. Northern European Oak - Quercus robur being attacked by a form of Powdery Mildew. Norway Maples have also be attacked this year in the same exact way. This has not happen previously in my years here. Yes there are some wet weather factors, but wet weather here is not new at all. Northern European Birch ( Björk - Swedish) has very small leaves and few of them. The leaves likewise are being attacked by something but by who knows what. They are simply all blighted by some pathogen. These next two photos were actually taken on June 13, 2012. My purpose in holding the leaf in hand earlier this year was to illustrate the size with a sense of scale here in late Spring and contrast this later in July 2012 after we had some of the first summer time summertime Lightning Storms which have an energized signature in the water which triggers rapid large growth in new plant leaves. I wanted to document for everyone similar things I have observed and experienced in the areas southwest of the USA where such rainwater creates a sort of giant growth phenomena. I experienced this with some Sunflower plants here four years ago after an electrical storm and the point of size contrast after that first Thunderstorm rain was very dramatic compared to previous uneventful showers. Unfortunately I never had a chance this year to photograph this incredible growth contrast. Okay, so now you can see what the foliage looked like in June 13 2012. Under previous year's circumstances after summer Lightning Storm rains have their incredible effect on the foliage, just ONE of those leaves after having newer growth spurred on by the chemical signature from Lightning origin rain water would normally hide my hand completely. Now that's normal. But look below at what they look like now, even after summer Lightning Storm rains which have been a constant feature this year 2012. The above photos were taken in early August when all forest foliage here should look at it's peak of vitality and brilliance. Not only are those leaves above the same size as they were in the Springtime, but growth simply shut down and all manner of pathogen attacks set in. The above apple tree appears in a neighbours yard. This tree is normally loaded with much larger apples and fuller foliage, These apple examples are not only small, but blighted and blemished as well. Even when they are not attacked as the below photo with the red apple tree, they are still very small and foliage sparse compared to years previous. The bottom line here is that there are countless scientific studies done which reveal just how incredibly nature keeps itself balanced and in an orderly state. These studies give great insights into the tremendous possibilities of biomimicry in creating healthier solutions. Yet amazingly these are clearly rejected by the powerful wealth obsessed Corporations around our globe who opt out of Natural Holistic approaches for an archaic conventional means of technology that should have been replaced just a couple decades ago. The problem is that there is often times no money to be made for these Business models or at least in their minds. Governments worldwide side with them for no other reasons than their tax revenues would drop off sharply or so it's imagined. Yet none of these entities(Governments, Big-Biz, Bad Science) ever seem to count the cost of this planet's Natural Mechanisms for sustaining life suddenly breaking down. One also has to wonder with the incredible findings like the topic article here referenced at the top of this post, why these mechanisms have failed out in Nature here in Scandinavia and elsewhere in light of the degradation documented in the photographs. Why hasn't the digital communication between the bacterium and plant life worked in this instance ? I get why they fail with industrial agriculture, landscaping and gardening, but why now with nature ? Could it be some of the bad science Geo-engineering or Weather Modification projects being covertly done around the globe by superpowers like the United States, Russia, China and whoever else ? Only more research will reveal and expose this for a certainty. Unfortunately it may be to late when that happens and even then the guilty parties involved will only deny & disavow any knowledge of this and proceed then to spin excuses through their Lawyers and Public Relations Departments.